Politics is the process by which we resolve diverse and sometimes conflicting interests. In the workplace we often think of politics as a negative — a corrupting process that hurts people and organizations. And sometimes, that's what happens. 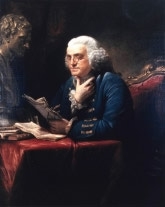 Benjamin Franklin, painting by David Martin, 1767. Photo courtesy U.S. Library of Congress. But politics comes in many flavors — it need not be destructive. Constructive politics gives us a way to make decisions together that take into account the needs and goals of diverse groups. Practicing constructive politics is an art, and leaders can model the best practices. Here are some ideas to keep in mind when practicing politics. Ideologies provide guidance when we aren't sure which way to go. And sometimes, when we adhere to ideologies too closely, they limit our ability to account for uncertainty or for the views of others. Pragmatism creates the flexibility we need to take into account the uncertainty that prevails in most environments, and to enable us to adapt decisions to the goals of diverse constituencies. When groups become polarized, dominance of one faction over all others is one path to stability. Sadly, this kind of stability is vulnerable in changing environments. To achieve a more durable stability, seek solutions based on inclusive alliances. Taking the long view comes only at the expense of flexibility. In many cases the situation is so fluid that the future we were trying to accommodate never actually comes to pass, so the flexibility sacrifice we make today can be fruitless. By shortening your time horizon, you can recover flexibility, and that flexibility enables inclusiveness. Some political operators choose tactics designed to "teach them a lesson." This is a behaviorist strategy, or sometimes it's driven by a desire for revenge. But because true learning is a voluntary activity, and "they" never enrolled in our "course," "they" rarely learn the lesson we had in mind. Hurting or terrorizing people isn't likely to convert anyone. At best, it begets compliance; at worst, destructive conflict. Neither outcome is a sound basis for an effective organization. Broad sets of goals tend to impose constraints that limit options. Narrowing your goals, which can feel like a loss, can often create new options that lead to outcomes you wouldn't have achieved otherwise. Focus on your must-haves, with "must" narrowly defined. Set aside for now the rest of your goals, and revisit them after your new alliance has had some successes. For a connection between positive politics and retention, see "Retention," Point Lookout for February 7, 2007. Would you like to see your comments posted here? rbrenCyAxaXaPQntjXHdpner@ChacLsHLtdatZwmAWIWaoCanyon.comSend me your comments by email, or by Web form. Managers and supervisors who take credit for the work of subordinates or others who feel powerless are using a tactic I call Credit Appropriation. It's the mark of the unsophisticated political operator. When project teams and their sponsors manage risk, they usually focus on those risks most closely associated with the tasks — content risks. Meanwhile, other risks — non-content risks — get less attention. Among these are risks related to the processes and politics by which the organization gets things done. I offer email and telephone coaching at both corporate and individual rates. Contact Rick for details at rbrenegnXSBMsKVxJEchZner@ChacbdAZfNgasqaDeoXwoCanyon.com or (650) 787-6475, or toll-free in the continental US at (866) 378-5470.